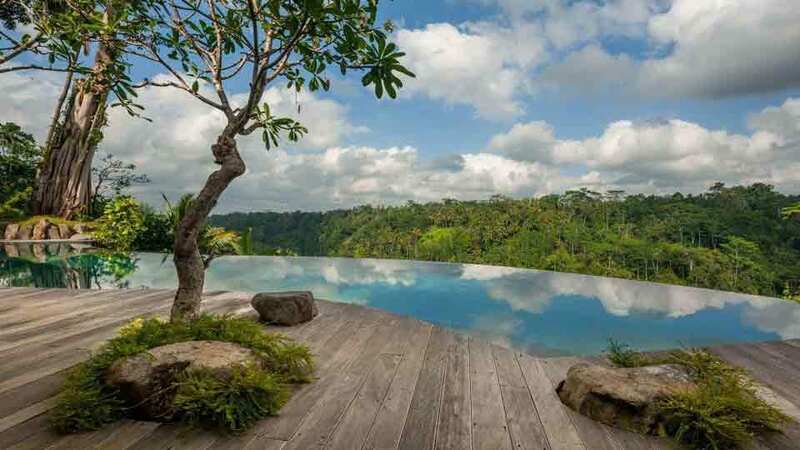 Villa Hartland Estate is nestled into the slopes of Ubud's scenic Sayan Ridge and overlooking a patchwork of rice paddies beside the Ayung River lies Bali's latest work of art - a thoughtfully conceived and charmingly executed Luxury 5 bedroom Luxury Bali Retreat - only a 7 minute drive from the centre of Ubud. 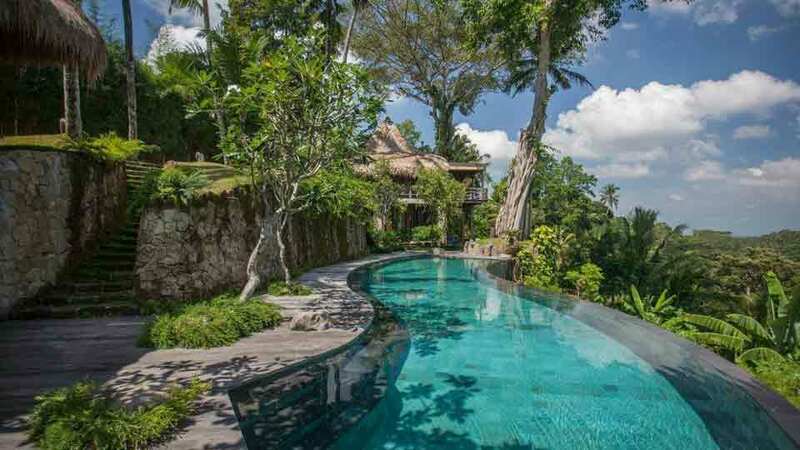 Carefully set into the landscape around the 6,000 square meter Estate by celebrated architect Yew Kuan (Como Shambhala Estate), Villa Hartland Estate offers 3 one-bedroom and 1 two-bedroom comfortable and beautifully furnished air-conditioned Suites. Each Suite has its own private space and extensive garden surrounding it. 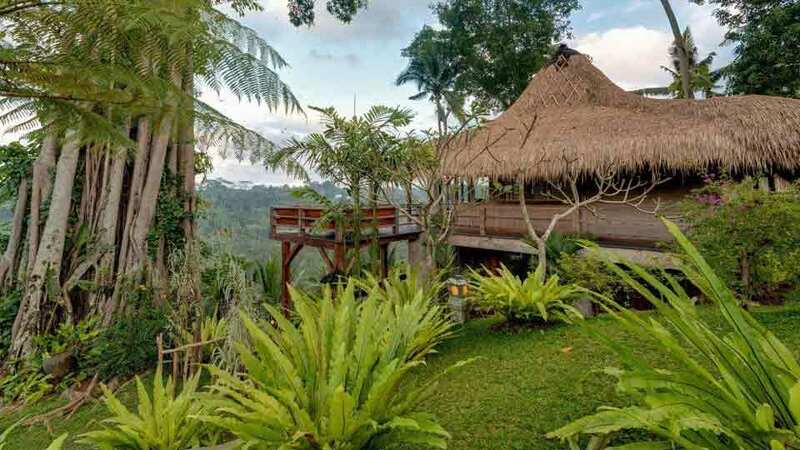 Three Suites are made from reclaimed teak houses – a “Joglo”, a Java house and a “Gladak”. Each grass–roofed Suite features a spacious double bedroom, luxurious bathroom and a large wooden deck with an outdoor lounging area and open spaces for early morning Yoga or Meditation. The downstairs bathroom of the Joglo Suite is more than spacious and features a unique shower - which leaves one breathless with admiration - and its own wooden deck overlooking the valley. Spectacular! The fourth Suite, "Marian’s Cottage" - is a two-bedroom stucco cottage with a large Living and Dining Verandah leading off the Master Bedroom. A smaller Double Bedroom interconnects. Both bedrooms have their own private garden bathroom and separate entrances. The Double Bedroom also has a private patio with table and chairs overlooking the verdant tropical gardens. Villa Hartland Estate boasts not one but TWO dining areas! 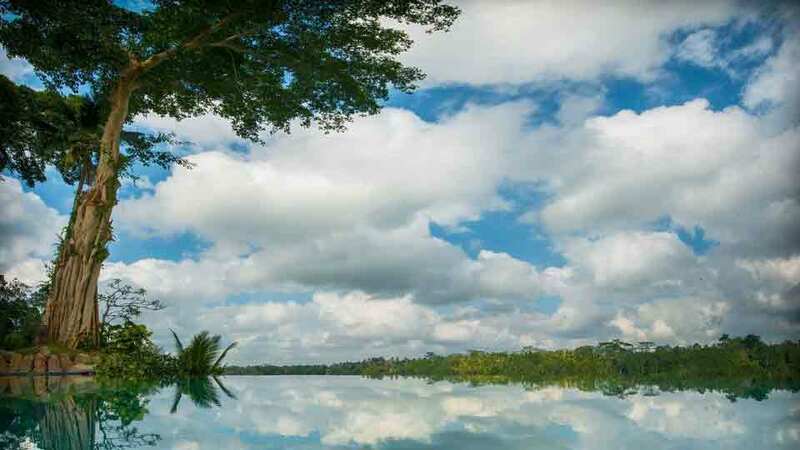 To the rear of the Suites one finds a full kitchen and cosy, comfortable open-air dining room, whilst a separate Dining Pavilion sits atop the Pool House offering spectacular views across the river to the rice fields and the mountains beyond, and to the sunset and the distant ocean. A smaller but fully equipped kitchen adjoins, whilst the Pool House below houses shower, bathroom and dressing room. The Dining Table and Benches in this Pavilion have been hand-made on the property from large pieces of old buried teak. In fact, almost all of the furniture has been hand-made on site from reclaimed teak or old ulin (iron wood) by Javanese artisans. The unique stone featured in the Pool House and some bathrooms comes from the island of Sumba. Two Meditation Gazebos are located in secluded spots further down the hillside towards the organic vegetable and herb gardens. They are fan-cooled with large comfortable couches, mosquito nets and, of course, amazing views! 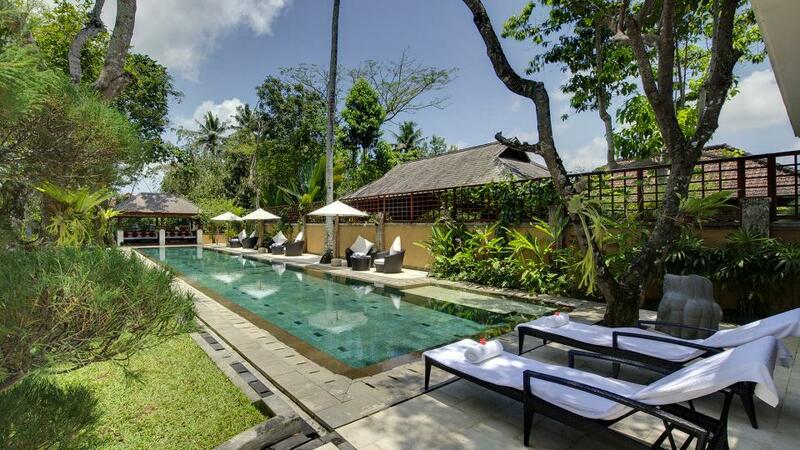 The private villa property also boasts its own pure natural spring from which cool water is pumped up for the pool, the organic vegetable and herb gardens and for household use. 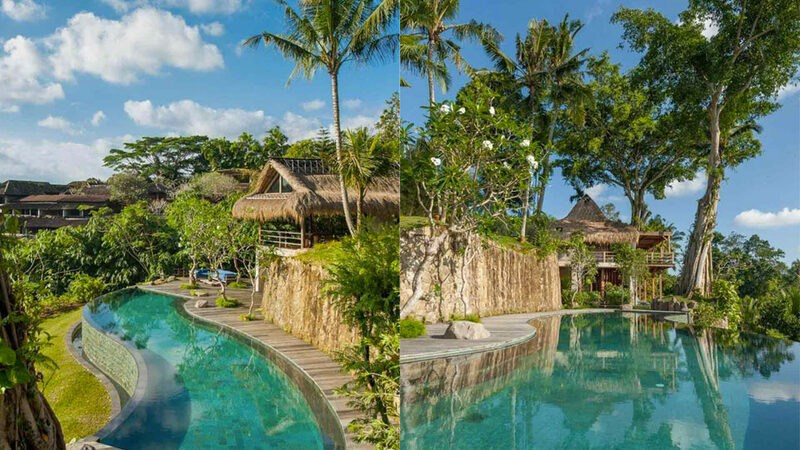 10 minutes (4.4 km) drive to Cultural town of Ubud, 70 minutes (30.3 km) drive to Seminyak Night Life, 70 minutes (38.5 km) drive to Bali's Ngurah Rai International Airport. 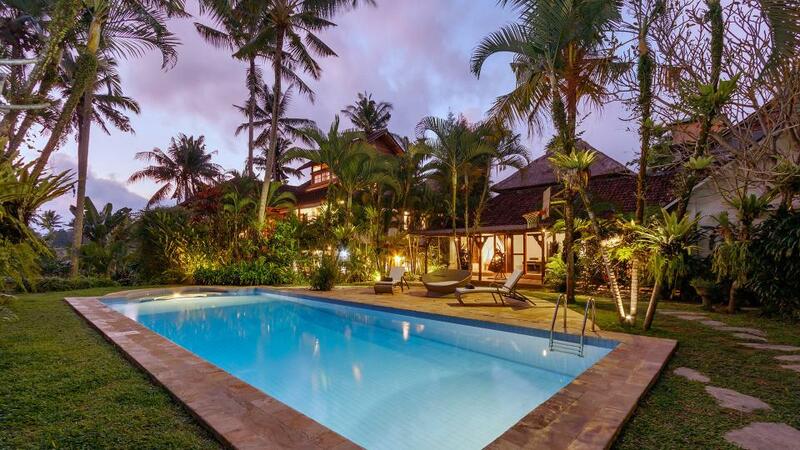 Villanovo est une agence spécialisée dans la location de villas de luxe et de maisons de prestige Centre - Ubud : Piscine, Enfants bienvenus, Sur un golf, Personnel de maison, etc.